Welcome back, it was another busy one magic-wise for me this last weekend. My shop, The Arena, had our game day tournament and i actually got to play. I took a deck that i wanted to try and thought was a lot of fun but wasn’t a “good” deck. But i knew that going into the event. Ended up going 1 and 3 loosing to the winner of the tournament, the guy that took second and the wife who was not having fun and we were having a good time so i might have “let her win” game 2, then she just smashed my face game 3 super badly. Which i think made her smile a little bit. So it was worth it. Sunday, was an away game vs Hays in our Store Vs Store series as is the norm i was on the draft team. While i feel good about the format i was unsure about the Hays guys and their draft style. My last two away games were not great for me going 2 and 2 i believe. Spoiler alert i drew my first round which is my normal play for winning out the rest of the matches. Which i did. I know that some of the cards are hard to read so i will hit the highlights. Qarsi High Priest, insane every time i had it other then the one game where it was my only guy for like 4 turns. S Faithful, I had 2 of these guys and while i only main decked the first one; the second one was huge in many games. P Familiar/J Sage, 2 drops that drew a card when they die are good. Go figure. Hand of “the bad touch” Silumgar, 2 power deathtoucher? Yep, he went almost all the way one game before trading way up. M Loremaster/Spell-Eater, these guys did a ton of work. One game i was able to trade while regrowing the Foul Renewal to regrow/kill a card advantage dude and another real threat. Marang River Prowler/Skeleton, MVPs! Not kidding. These guys are real. And they carried a ton of weight. At one point i was Attacking with the prowler then sacking him to the high priest then replaying him for the value. So good! O Interceptor x 2, 4/2 fliers. Yep, Good. Write into Being, I want this card in constructed deck. It did everything for me this weekend. Hit morphs, found or buried lands as needed. Just an limited all star. M Adept, just yep. There was one play where i was facing down a huge flyer and my opponent cast the rebound protection spell on it naming blue (my only flyer and this guy) but i had a Coat with Venom (another all-star) giving a morph flying and deathtouch and blowing out my opponent. 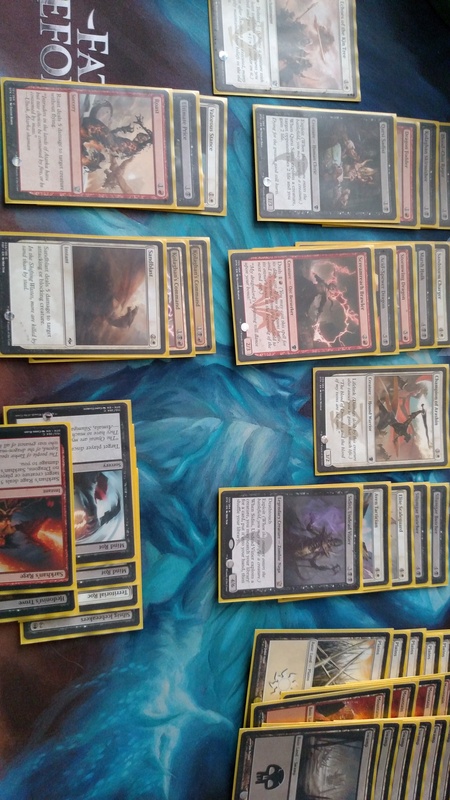 V Aven/ G Drowner, these guys just drew me so many cards it was insane. I only think there was one time the Drowner found anything other then great spell, land, land, land. The games where it found Foul Renewal i was unbeatable. A Statue, I love this guy if i have any value guys OR if my opponent is on white/x. Pacifism, is a real spell in the format. This just eat it and rebuys the value while just making a super killer. Coat with Venom, I think this is one of the best black commons. Top 5 for sure. Mirror Mockery, Also super good. There were a lot of places where i could but it on their guy and “blue Pacifism” it. Which i did a few times. And there was as many times where i was just able to get value by cloning my Avens/Drowners. Whisk Away/Flatten, good removal spells. There was an attack where the warrior agro deck attacked me with 5 or 6 2 or 3/2 and he had the warrior that made all his warriors require two blockers. I was able to flatten him after baiting him into an attack. Then i lined up all these complicated blocks opening myself up to taking like 10 damage (via the pump warrior). But the opponent decided to go for the big blow out with a butcher’s glee on my M Adept/V Aven block on his 3/2 first striker. Away with you nasty 6/2 first stikeing life linker. Foul Renewal, my first pick another one of them all-stars. If you can get one and regrow it, do it! Reach of Shadow x 2, 5 mana removal…. Still good in limited. Sideboard super helpers Shambling Goblins x 2, i brought them in against the warrior deck and they were huge. Well that was it, between the boy and myself we got 11 packs for 30$ and i picked up a lot of important points in the Store v Store scoring. I just need to keep it up. Alright kids it took me an hour to type this up and i need to get to bed. So to be clear i am starting this post before midnight my time so i am going to count it as Monday. I love my job at The Arena, hands down best job ever. But sometimes there are surprises that well i didn’t foresee, hence the word “Surprise.” With the new PPTQ (preliminary pro tour qualifier) system all the local shops get to have their own little “big” tournament. I am hearing some PPTQ’s are not firing and i am not just talking about in Smallville, Ks but real places like Boston and Chicago. Yep some shops just don’t have the player base to draw in the players, that and format calls. Hint, no one that has legacy decks just laying around wants to play a legacy PPTQ (of 8 people) to go to a standard regional PTQ. And the shop owners are losing money paying judge staff for 10 people to show up. Now some places are getting 100-200 people PPTQs and they are having another issue. There PTQ are too skilled. And a lot of those players are traveling to “soft” PTQs to make things easier to pick up invites. If you live in a smaller state, Magicwise anyway, you might get to see a lot of just off the train pros looking to get back on the train by crushing your dreams. How much fun would that be? My personal problem? Glad you asked, the lack of level 2s in my area, and for those non Magic kids reading you have to have a level 2 judge for your PPTQ or your winner doesn’t get to qualify for your PTQ. Kansas only has a handful of level 2+s (four) and they are in high demand at the moment. Basically, making it a sellers market and some of the judges are looking out for number one; as they should. But at least let us know more then two weeks out would you? When we contacted you 3 months out and have been speaking with you weekly and then you say oh i am booked that day. Surprise! As for my problem, we are emailing the regional judge overseer person for our area, to see if there is anything he/she can do to help. But i am not holding my breath. I have the feeling that we will have to cancel and cut our losses. See if i can’t paint some lipstick on this pig and take it to the dance as my date. If only level 1s could run the PPTQs for low population areas. Areas with an expected turn out of less then 20-40 players. And heaven help us if the Regional PTQs gave out PT invites based on number of players in said state. Well i hope someone at WotC, is watching what is happening and can make some changes to the policy. Guess, i am starting judge studying soon. Not sure how fast i can get my level 2 but i know that i could almost make up the salary from my part job just working a few PPTQs a month. Seems like a reasonable thing to me. Okay need to do some reading and try to get to sleep before 2 am this morning..
Look at me kids, I am writing about Dungeons and Dragons Online for a change. Watch out! So i have been looking at the different Twitch numbers. Number of viewers, number of streamers things like that and do you know what i learned? That DDo has less viewers and streamers then pen and paper Dnd and games like Mario Sunshine. Amazing games btw… But still it can be aggravating at times, because you know what? I like to watch others play as long as they are being entertaining. I don’t think it is any secret that i am into Magic right now. And a lot of the time i will just log into DDo and do some mindless grinding (or while working) watching someone else play magic on the other screen. I know that we have had a big push lately, but it is just not enough. I wonder what it would take to boost the numbers. Looking last night (after servers got back up), Magic got to around 3k and DDo didn’t break 100 and League was over 80k. We just had an update and my personal twitter feed just had a lot of nothing. Today is better, but not great. So this is where my head is… ChannelFireBall helps some of its Magic writers that also happen to be streamers pay for their time. I know that other major websites do the same. So why not DDo? I look at the League streams listed now and i see at least 10 sponsored streamers right now. Seems like cheep advertising to me. The wife and i have been talking about trying moving my for $$ job to streaming 4-5 nights/days a week but i couldn’t pay anything with the low numbers i see in the DDo streams. The highest DDo stream i have seen was about 150 and that was one of Jerry’s Lunch streams where he was previewing things with a Dev and giving out codes like candy. Not saying why people where watching, but i saw a lot of “hey Jerry is giving away point codes on the stream” when i fired up my game and looked in the channel chats and not a lot of “wow X looks cool as hell”…. I am just saying, who would like to see Turbine sponsor a few part time streamers? Pay for their subs, kick them a few codes to hand out on streams etc… Hell i would move a lot of things around for a few $ in my bank account. All in the name of advertising. Speaking of ads, why don’t we have some sweet Youtube ads targeting gamers. I have to watch Rainbow Six new game ad about 10 times a day think a DDo ad would pop up in my Youtube…. Oh well, I hope to look into the Rogue pass this week and see if there is anything that makes me want to take more then 2 rogue on any of my builds or rework my ranged rogue. 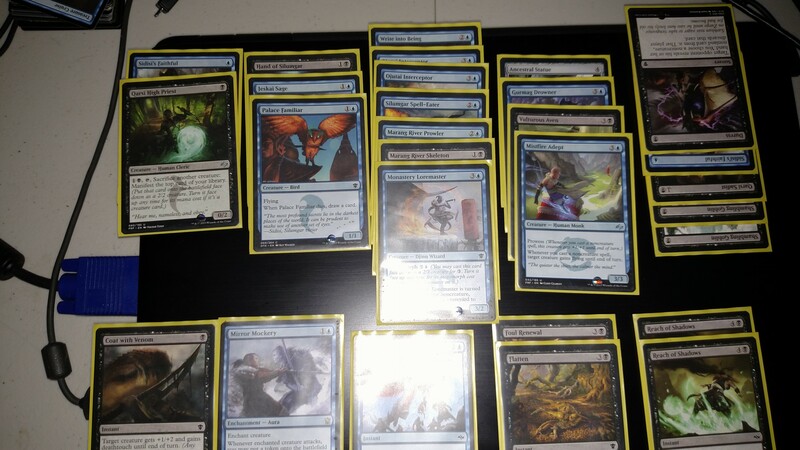 This is my 4-0 draft deck from the Store v Store event this last weekend. Opening that Siege,in the third pack, was a real boon. Angler and a few pick ups made the final list but i cut a lot of good cards from the other store players. Overall the Shop did real well, with Standard being the closest with us winning by 6 points. 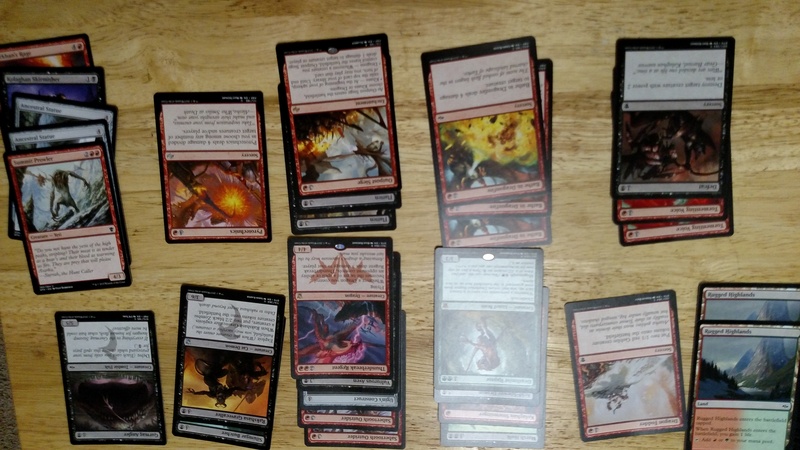 While Draft and Commander was mostly a blow out. I saw a real good aggressive Assault Formation list. It was kinda close to the list i have been playing with but it looked real good and had some teck i didn’t think about: Kruphix’s Insight. Kruphix’s Insight, is so good that i am going to add some to my list for sure. This list is laid out a little different then i normally would. I have a small tutor package and reanimate package. I could see more silver bullet package but i would leave that in the sideboard and try to bank on people not knowing what is up for game one then go adjust as needed. Now the list i saw this weekend was just white/green with 8 of the 0/4 one drops and was all in on game one on the Assault Formation. But i really like the balance of control and midrange. May all your opens be a good mix of relevant spells and lands.